I was super happy that my box came earlier in the month this time. I get impatient waiting:) I've resorted to spoilers on the Birchbox website while I wait. If you have seen recent posts of mine, you will know that I am on a quest this year to use up products and cut down on my spending. For that reason, I did not open and try some of this month's products yet. I do not want anything to go bad because it has been opened but not used up or being used. Beauty Protector Protect and Oil - I have liked all the Beauty Protector products I have tried. I like the smell of this oil. I used it on wet hair that I was planning to let air dry to see if it would combat frizz. It helped some but did not work as well as the Macadamia Healing Oil Spray which I love. If the full size is cheaper, I might consider purchasing it just because the Macadamia is so expensive. However, I have quite a few hair products to use up before I purchase anything. Jelly Pong Pong Glow Getter Highlighter - This is a liquid highlighter. I have not tried this product because I do not want to open it and then have it sit around open. I am currently using a highlighter from Well Beauty which is all natural and needs to be used up as it is already open. Mirenesse Glossy Kiss - This is a glossy lip pencil and I do like the feel of this product. I received a coral-red shade which is not normally a color I reach for. I think I will try it out as a summer color when the temperatures warm up. 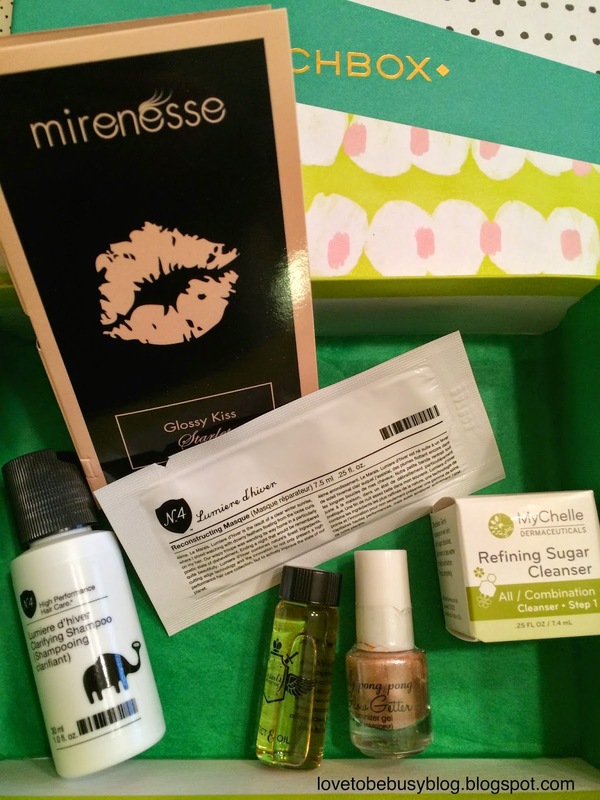 MyChelle Refining Sugar Cleanser - This product is very interesting to me. First of all, it smells amazing! I put it in the shower to use as an exfoliator as I do my other scrubs. The interesting part of this scrub is that, as I massaged it into my skin, it felt like it turned into a creamy cleanser. I'm excited to continue to use this product. No4 Clarifying Shampoo - This is another product I have not opened because I am trying to use up a few shampoos that I already have open. I plan to try this next so you will see it in my empties in the next month or so. I also received a foil packet of the No4 Reconstructing Masque as an extra. *All opinions are my own. Products were purchased with my own money. I was not compensated in any way for this post.